Bertha Palmer wrote in her 1939 book Beauty Spots in North Dakota, �Mr. Allen has lived through the most remarkable stage in the history of North Dakota and surely the most romantic. 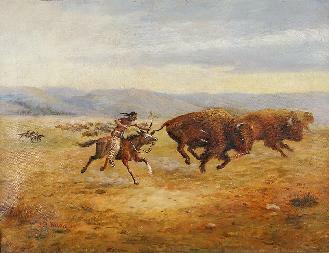 He knew the pioneers, the Indians and the buffalo and he saw them all pass like some great pageant, and today the pageant still lives as he has seen it, in the many paintings he has left ...� Arriving originally in Mandan in 1881, Allen personally knew some of the most famous names in the region. The eldest of three children, <?xml:namespace prefix = st1 ns = "urn:schemas-microsoft-com:office:smarttags" />Allen was born on April 20, 1851 in Italy Hill, Steuben County, New York to M.P. Allen, a furniture dealer and cabinet maker, and his wife Nancy K. (Cook). In 1853, the Allen family moved to Ohio and then on to Paw Paw, Michigan, where M.P set up his own furniture business. When Allen was seven years old, tragedy struck the family with the passing of his mother Nancy. Thin and lean, he bought a set of Indian clubs in his youth to build up his muscles. He claimed exercising with the clubs paired and frequent bicycling was responsible for his longevity. On May 11, Allen arrived in Mandan to work as a timekeeper and telegrapher in the Northern Pacific Railroad shops but resigned later that summer. After returning from a brief visit east, established his taxidermy business in 1882. Allen did work for Theodore Roosevelt, the Marquis de Mores of Medora as well as various members of European nobility. His workshop contained Indian relics, original paintings, and a variety of mounted thousands of specimens of animals, birds, and fish found in the area. Upon his establishment in Mandan, Allen was able to focus more time and energy on painting. Working first with pastels, he soon switched to oil-based paints. His work often dealt with the early days of the state as a subject and frequently described landscapes, buffalo, and American Indian life using warm, earth-toned colors. Unfortunately due to this relatively amatuer status at the time of his death, his works have been spread dispersed over a wide number of collectors and the status of most of his paintings is unknown. Although painting skills were self taught and but a hobby, he has captured the spirit of early North Dakota scenes as have few trained artists. Several of his canvases hang in the State Historical Society of North Dakota. His realistic distribution of light and shadow, mass, division of space, and perspective presented the views as Allen saw them in his time, ascribing a historical, as well as artistic, value to his work. It was only just months before his death that he received any national recognition. In March of 1947, Allen was honored by the American Artists Professional League for "meritorious performance in the field of art," and was the first North Dakotan so honored. J.D. gained international attention when he loaded almost half a rail carload of relics and stuffed animal specimens and transported them for display at the 1904 World's Fair in St. Louis. In addition to painting, Allen was an amatuer photographer, poet, and violinist and was among the first men to volunteer to be an unofficial Boy Scout leader in Mandan. He taught the boys how to shoot with bow and arrow, and to swing the Indian clubs. He regaled them with stories related by his Indian friends, drawn from his own experiences with native Americans during his early days in Mandan. Allen had an ever hungry curiosity, an urge to try his hand at something new, but he always came back to his first love, taxidermy. 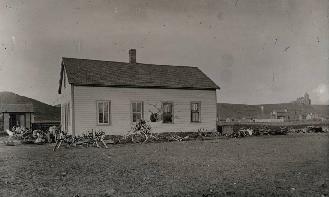 The front of the J. D. Allen home, located at 302 5th Avenue NW, was formerly one of the barracks at Fort Abraham Lincoln and one of the last the three buildings left standing. Mr. Allen had the building moved into the city, and eventually remodeled into his home and workshop. His shop contained a huge disarray of Indian artifacts and mounts of birds, animals, reptiles, and fish. A sign tacked above the door of his shop read "Order is Heaven's first law, " and beneath it, Allen had scrawled, "You are not in heaven." In Mandan on February 3, 1890, Allen married Nellie A. (Summins) Wilson officiated by Fr. Sloan. Nell was born tin Buffalo NY on September 9, 1859. Nell had one brother and one sister. Th couple had one one daughter, Ila K. (Swanson) born on May 21, 1891 plus the son and daughter brought by his wife from her previous marriage. J. D. Allen lived in Mandan for 65 years. He died in his sleep on April 28, 1947, and at the time of his death, he was the oldest active taxidermist in the country. He and his wife Nellie are buried in Union Cemetery in Mandan. This biography was based on research performed by Ben Nemenoff for the North Dakota Council of the Arts and articles from The Mandan Pioneer newspaper. We appreciate the contricutions of both organizations toward this Legacy Program biography.